Rio Dulce Guatemala is a magical destination in the East of the country. We visited the place more than once already and we loved it each time. But there are a few things you need to know about the area before including it into your Guatemalan itinerary! If you are wondering what to expect when you travel to Guatemala, check out this post: interesting facts about Guatemala. Rio Dulce is a very enjoyable place to travel to, as long as you take into account what it is. We read some reviews of other travelers who didn’t fully enjoy their visit to this place. In my opinion, this is not entirely true, if you inform yourself before you go! 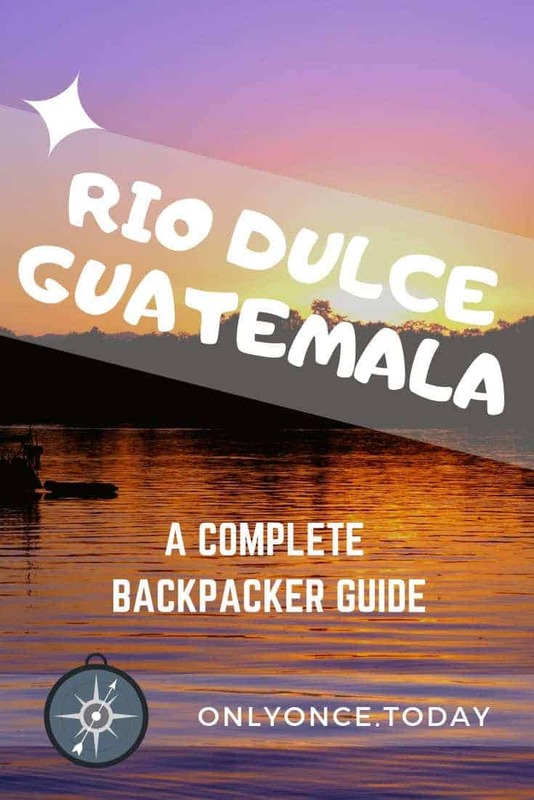 In this backpacker guide, we explain everything you need to know: how to get there, things to do in the Rio Dulce area, how to get to other hot spots like Livingston, and much more! 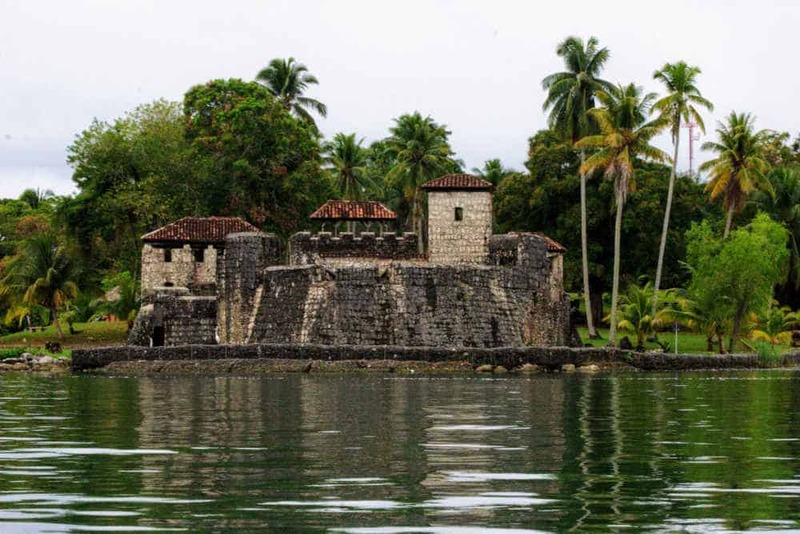 The Castillo de San Felipe stronghold is located on the banks of Lake Izabal in a location where the lake narrows. It was built in 1644 and served as a lookout and as a prison at some time in history. Shooting holes for canons are pointed in the direction of the narrow opening in the lake and I can imagine the dozens of ships lying on the bottom of this narrow gate into Guatemala. The inside of Castillo de San Felipe is filled with secret rooms and small labyrinth style passages. This place brings up visions of earlier days, where pirate ships and hostile sailing boats tried to conquer this beautiful country. Castillo de San Felipe was an important defense for the Guatemalan mainland. The Castillo de San Felipe is a five-kilometer uphill walk from Rio Dulce Town. It took us ages to get there and the bus only costs 5 Quetzales. Eventually, we discovered the slow boats. They bring you back from Castillo de San Felipe to Rio Dulce for a few Quetzales. 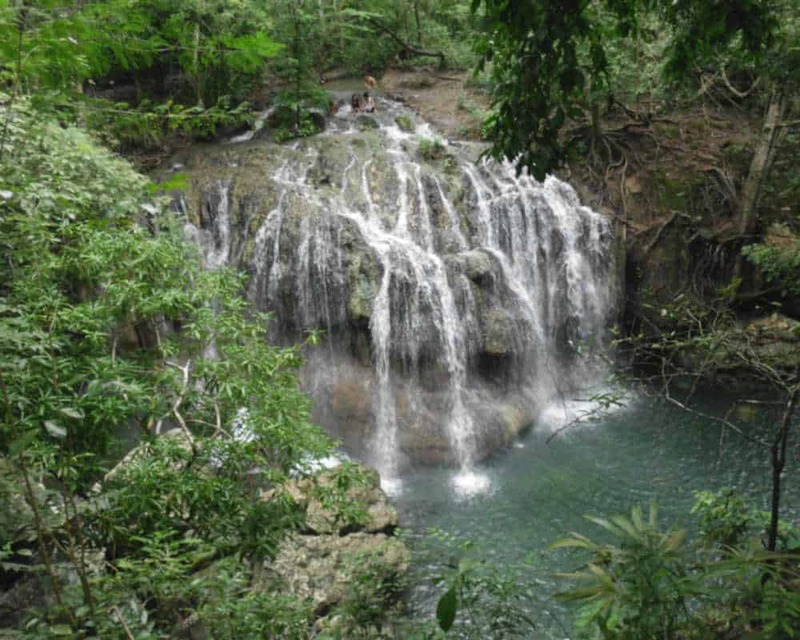 The Finca Paraiso hot springs are two rivers flowing together in a natural pool. One of the rivers is smoking hot, while the other is freezing cold. This exact location has been visited by indigenous people forever and it is believed the water has healing powers. It’s also a place where you can enjoy small fish nibbling at your skin. It a great, relaxing activity. Collectivo’s from Rio Dulce town to El Estor pass by the Finca Paraiso hot springs, which are located near Lake Izabal Guatemala. The collectivo costs around 15 Q one way. There are tons of children begging at the entrance of the hotsprings. We usually give them pens instead of money. Finca Paraiso also is a lodging. We didn’t try it though. Livingston is a small Caribbean community on the banks of the Rio Dulce where the river meets the ocean. The original inhabitants of Livingston ended up here after their slave ship sank. It is also the only Garifuna community in Guatemala. This makes Livingston very different from the rest of Guatemala. The laid-back vibe, the Rasta people, the colors, it all fits together as one vibrant village on the banks of the Rio Dulce river. Livingston also offers some of the only beaches in Guatemala on the Caribbean side. Visiting Livingston is free, but you need to catch a boat there. Keep reading for more information about the boat trip. Livingston has a big pit in the village center which holds one or more huge crocodiles. A local guy told us they caught them in the river. Shall we swim in the river again? This trip is actually the same as the boat trip to Livingston. We mention it separately because we enjoyed the boat ride a lot and it is an awesome part of the trip to Livingston. We regretted to reach our destination so quickly. Despite the occasional cruise ship, life on the river is still pretty rural. Scattered along the river, we see small houses and huts. Children are playing with their dogs, girls mostly. The boys are out on the river, fishing old school. The closer we get to the sea, the more birds we see, sitting on abandoned shipwrecks. 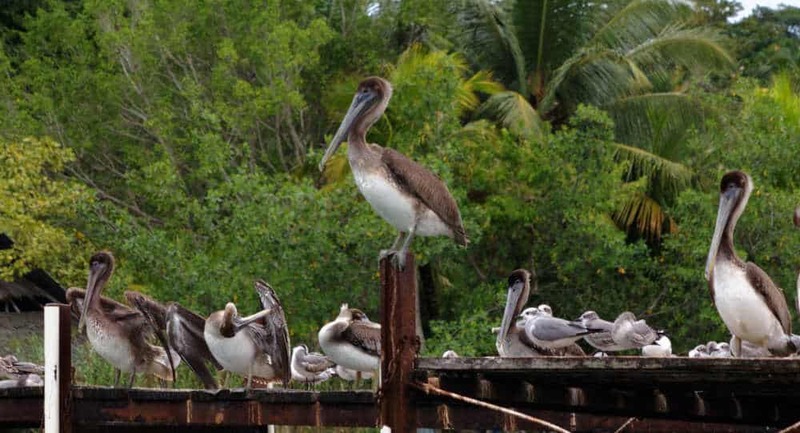 For the avid birder, there are many different bird species to be studied on the Rio Dulce region. The actual Canyon is the part of the river that meanders through the jungle and where you can only get through by boat. Steep shorelines look impenetrable and if they are penetrable, they don’t look like you’d want to make your way through! Prices for the boat trip vary heavily depending on how you book your tour. We recommend booking the trip to Livingston with your hostel. If you book a specific tour of the Rio Dulce canyon in town, you will, without a doubt, pay too much. You can expect to pay something between 120 Q and 200 Q per person. A lot of travelers get disillusioned when they arrive in Rio Dulce town. That’s kinda logical because the town itself isn’t very pretty. It consists mainly of one big road, leading to the bridge over the Rio Dulce. All life, stores, and shops are located on the Rio Dulce main road, which is heavily used by trucks and buses. But in the end, you need to pass through the town in order to get anywhere. So we ended up spending only a little bit of time in the town and we used it as a hub. And it served its purpose well! Cheap food is available on the main road. Restaurants by the water charge a lot more for basically the same food. The main road in Rio Dulce town leads to Honduras and there is a lot of traffic. When standing on the bridge, you can see Lake Izabal and Castillo de San Felipe, the stronghold that used to protect the Guatemalan mainland from the Pirates of the Caribbean! On the other side, the river widens before it leads into the canyon. Underneath the bridge, you’ll see a very large hostel, which we checked out but abandoned quickly, and a petrol station for boats! 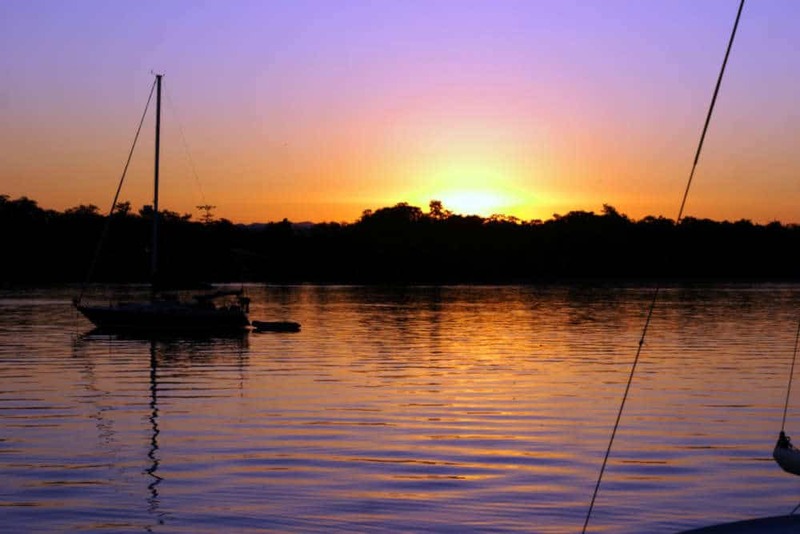 As Rio Dulce offers a nice harbor, a lot of expat sailors have stranded here and fell in love with the area, so they seem to just stay there forever. Each year, there’s a big sailing event which attracts sailors from all over the world. 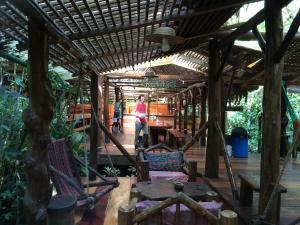 Aside from spending a night in one of the Rio Dulce hostels, you should definitely spend a few nights in a finca on the river and experience the feeling of being surrounded by dense jungle. Most Fincas have a deck and swinging rope for river fun. Our hostel owner reassured us there were no predators in the water, but you can never be sure. We passed time swimming, reading, kayaking, and sweating in the sauna hut. Most travelers arrive in the town of Rio Dulce from destinations all over Guatemala. From this town, they travel on to the river finca’s or to Livingston. You can’t get around it: you have to travel to the village first and continue from there. The town of Rio Dulce can be reached by public transportation or with a tourist shuttle. Both options are good, but they have different price tags! We opted for a public bus to go to town. Even though we thought the driver was a mad man, we arrived safely in the town. 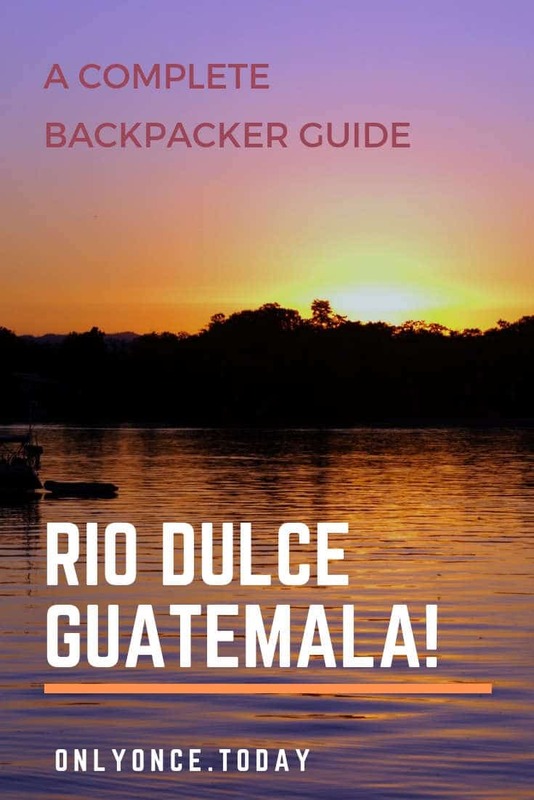 Rio Dulce can be reached by public transportation from Flores and Antigua in Guatemala. But you can also reach the town from Copan in Honduras. Most finca’s offer a pickup service in town. The best way to take care of this is to get in touch with your lodging before you arrive. Usually, pick up in town is free of charge or included in your room price. Livingston can only be reached by boat. Even though we told you, you have to go through the town first, that’s not entirely true. Livingston can also be reached by boat from the Caribbean side. You can get a boat to Livingston from 3 different locations. 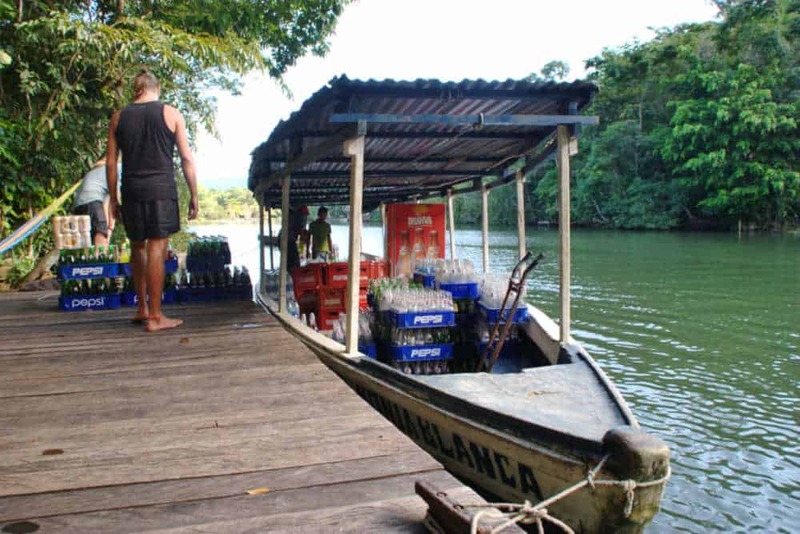 The first is obviously getting a boat from the town of Rio Dulce to Livingston. But you can also get there from Puerto Barrios, which is located a little to the South. And the third option is to get a boat from Punta Gorda in Belize. For the second and third option: Punto Gorda and Puerto Barrios, you need to catch a water taxi that travels between these 2 harbors. On Tuesdays and Fridays, they make a stop in Livingston. 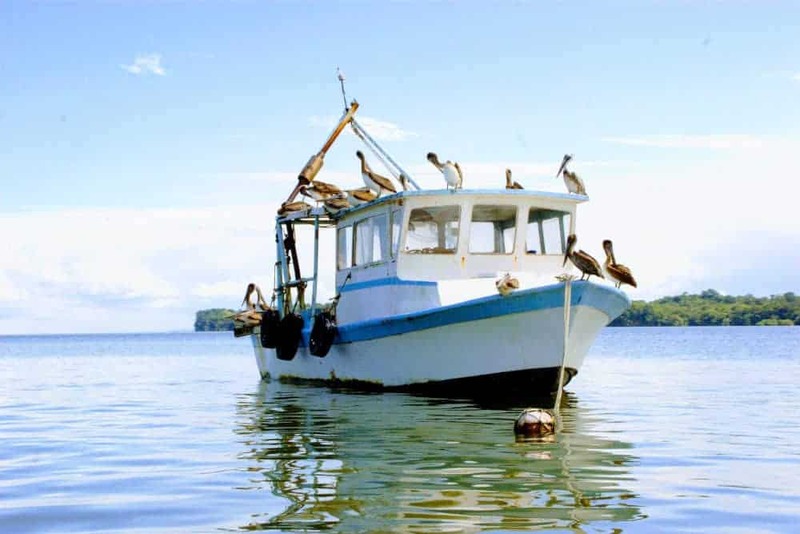 This website offers information and time tables for the water taxi between Punta Gorda and Puerto Barrios. Lake Izabal and the Rio Dulce area are very accessible to travelers who are backpacking in Central America. It’s fairly easy to reach by bus from the North or the South. We traveled from Rio Dulce Guatemala to Semuc Champey, which is another great destination to visit while backpacking in Guatemala. Don’t be discouraged by people who allowed the first sight of the town prick into their dreamy balloon of expectations. This area belongs to one of the most beautiful places to visit in the entire country and it is very worthy of your precious time! Would you rather join other travelers to explore Guatemala? We recommend this cool 3-week trip by G Adventures. Are you an LGBT traveler? Read our guide about LGBT travel to Guatemala and what it’s like travel Guatemala as a gay or lesbian traveler.